When you have a large amount of data in your spreadsheet, you will notice that often the cell is too narrow to make all that information visible. There are a few ways you can deal with this problem. One of them is text wrapping. If you want to read about other ways to deal with this problem, read lesson: adjust text in a cell. As you can see, the text in the “Occupation” column is too wide. Let’s fix it. First, choose cells for which you want to wrap text. Now, you have two options to do it. 1. Click HOME >> Alignment >> Wrap Text. 2. Right-click to open a contextual menu. From the “Format Cells” window click the “Alignment” tab. In the “Text control” group check “Wrap text”. 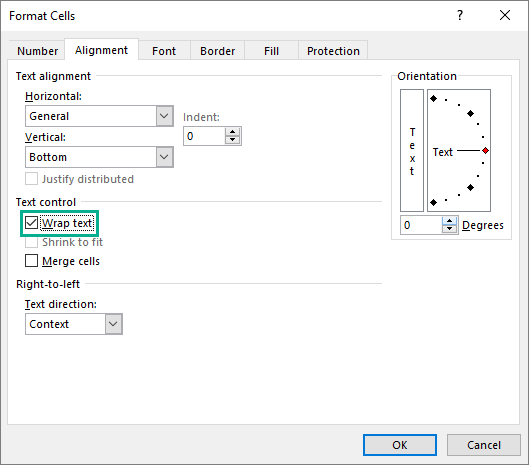 Instead of using the “Wrap Text” button on each cell, you can select empty cells and apply text wrapping. Now, each time you enter some text, it automatically wraps it inside those cells. To unwrap text, click cells you want to unwrap and then uncheck the “Wrap Text”.